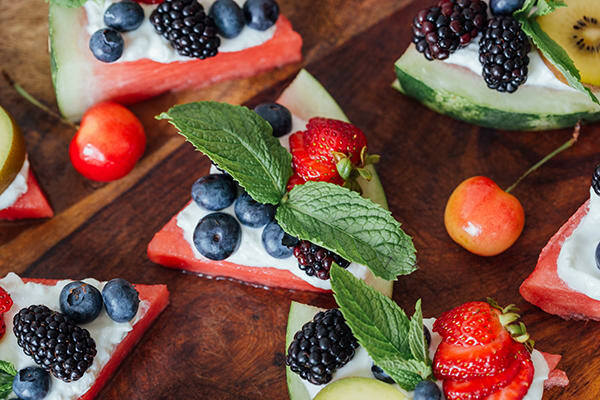 How Pinterest-perfect are these watermelon fruit pizzas? 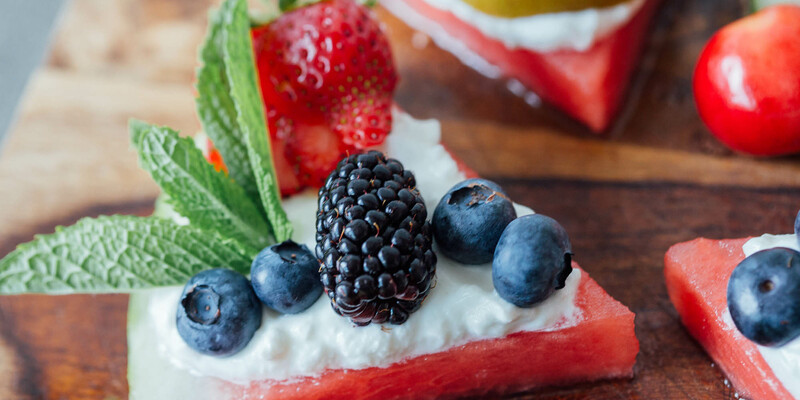 They’re made of juicy, delicious fruits layered on top of Greek yogurt and luscious watermelon slices. They’re almost too pretty to eat! But let’s be real, no food is ever that pretty. Let’s talk about watermelon for a second. It’s refreshing, sweet, and delicious, but watermelons are usually enormous (unless they’re baby watermelons, which are adorable), which means you can provide snacks for a whole party with just one. Watermelon is in season year-round, and U.S. harvests are available between April and November and it can be chopped into cubes, muddled into a slush, sliced into triangles, or even carved into “sharks” — perfect for a fruity spin on pizza. 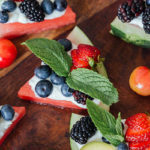 For this Watermelon Pizza, Greek yogurt acts as the “sauce,” adds a teeny burst of protein, and works as a tart and creamy contrast to the fruit. Without it, this recipe would essentially be a stacked fruit salad, and let’s be honest…that also sounds pretty tasty. Finally, we topped the pizza with blueberries, blackberries, strawberries, and kiwi. Talk about a brilliant flavor profile. The toppings add a powerful punch of antioxidants and bold, bright flavors — the pepperoni to the crust, if you will and kiwifruit orbs boast a level of tang that can’t be found in other fresh produce and packed with vitamin C and fiber, making them the cherry (or kiwi) on top of this recipe. 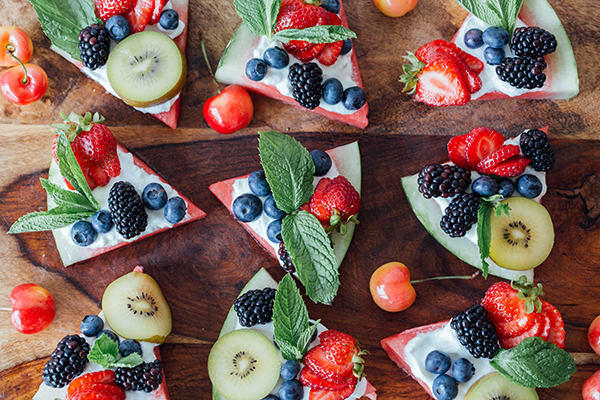 Check out these gorgeous watermelon fruit pizzas. 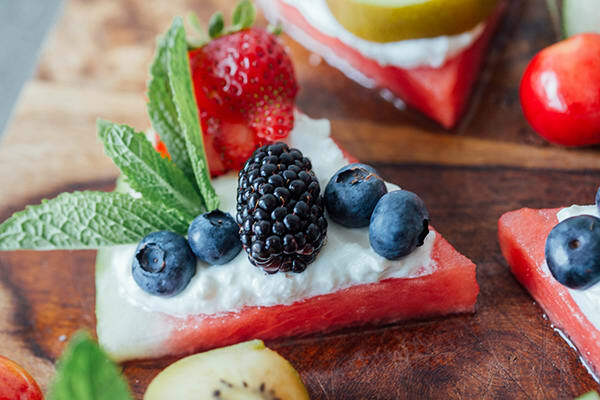 They’re made of juicy, delicious fruits layered on top of Greek yogurt and luscious watermelon slices. Spread each watermelon wedge with 1 Tbsp. yogurt. Top evenly with strawberries, blueberries, blackberries, and a kiwi slice. Garnish with mint leaves; serve immediately. Eliminate kiwi and increase blackberries to ½ cup. Photos by Amanda Meixner and Marie Jayme.